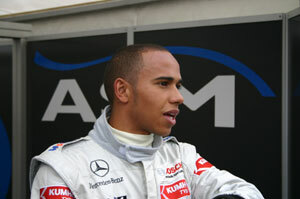 In the qualifying for the fourth round of the 2005 Formula 3 Euro Series season, Lewis Hamilton (ASM F3, Dallara-Mercedes, 1:11.021 minutes) succeeded in clinching his second pole position of the year. His team-mate, Adrian Sutil (ASM F3, Dallara-Mercedes, 1:11.806 minutes) finished second to share the first row of the grid with Hamilton, while Loïc Duval (Signature-Plus, Dallara-Opel, 1:11.156 minutes) and James Rossiter (Signature-Plus, Dallara-Opel, 1:12.036 minutes) secured third and fourth grid positions. Due to the special characteristic of the Pau street circuit, the qualifying was contested in two groups. The drivers of both groups had 20 minutes time to set their qualifying laps for the 29-lap race on Sunday. In the first group, consisting of the drivers with even numbers, Adrian Sutil took the lead with just five more minutes to go. Two minutes later, Fabio Carbone (Signature, SLC R1-Opel) improved to third place in his group, thus gaining a promising position on the third row of the grid. In the group with the uneven numbers, Lewis Hamilton and Loïc Duval were involved in a thrilling battle, with the Briton coming out on top. Several drivers, Ross Zwolsman (Team Zwolsman, Dallara-Opel, 1:13.075 minutes), Marco Bonanomi (Prema Powerteam , Dallara-Opel, 1:12.604 minutes) and rookie Átila Abreu (Mücke Motorsport, Dallara-Mercedes, 1:20.610 minutes) had to find out that the slightest mistake can have serious consequences, at the narrow, twisting 2.67-kilometre circuit at the foot of the Pyrenees, when the tyre walls made an early end to their qualifying performances.